Sunshine and 70s in Denver this week! It will be nice and warm most of this week but get ready for a chance of snow this weekend. 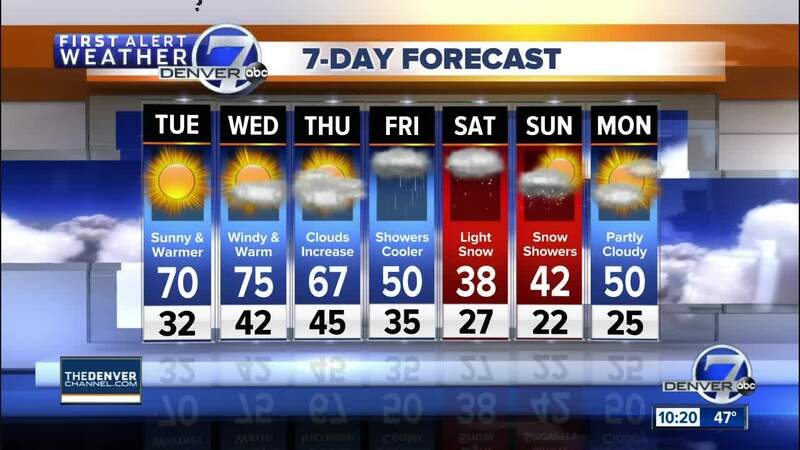 DENVER — Colorado will be in between storm systems for the next few days and that will be a pleasant spot! Clear skies through early Tuesday with cool, but not cold temperatures for late March. Morning lows will be in the teens to middle 20s in the mountains and upper 20s to mid-30s for Denver the eastern plains. Tuesday will be the warmest day in 5 months with highs soaring to the upper 60s to low 70s in Denver and across the eastern plains. In the mountains, expect bright sunshine and temperatures in the 40s to near 50 degrees. Wednesday will be even warmer with highs soaring into the 70s over eastern Colorado! Wednesday will be the warmest day of the week, but the winds will also pick up across Colorado. Our next significant system looks like it will arrive by the end of the week, dropping our temperatures and re-introducing the chance for widespread rain and snow. Clouds will increase on Thursday with some rain, snow and thunderstorms over western Colorado. Friday will turn colder with rain likely for Denver and the eastern plains. Rain could turn to snow late Friday into Saturday. Temperatures will also take a pretty big dip, with 50s from Friday and 30s to low 40s through the weekend. It is too early to tell if there will be significant snow accumulation - stay tuned for updates!